in 1978 1 million citizens owned shares or bonds - equivalent to 10% of their financial assets. By 2007 it was 12 million and 27%. property inflation in the last decade has pushed net household wealth to nearly 7.5 times annual revenue. In the 20 years to 1997 the multiple averaged 4.4. 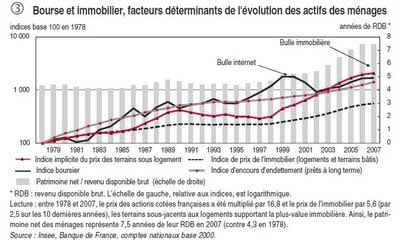 As of 2007 58% of the French owned their own home against 47% in 1978. Long term loans (mainly mortgages) were only 26% of disposable income in 1978. Today the share is 69%.